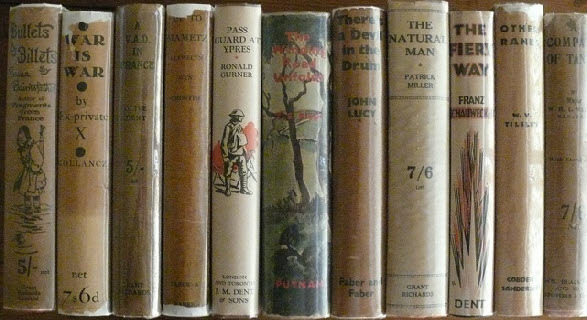 This site is designed to show dust jackets from books relating to The Great War published between 1914 & 1939. During this period most of the major works relating to the war were produced, often appearing in well designed & striking jackets. Unfortunately due to the poor materials used, the scant regard paid to the jacket as an integral part of the book, and the passage of time, these jackets have often become very scarce indeed. As I have acquired a large collection of these over the last 30 years or so I thought it might be of interest to others if I made them more widely accessible. These will primarily be personal memoirs, fiction & poetry with a few general histories if the jackets look interesting enough. They are all British, Australian, Canadian or American 1st editions unless stated otherwise. While the emphasis is on books produced by serving soldiers there are many from non-combatants produced for the home market. Of the over 2500 books by some 1400 authors shown here, only around 1/3rd are from my own collection, and are for information only. 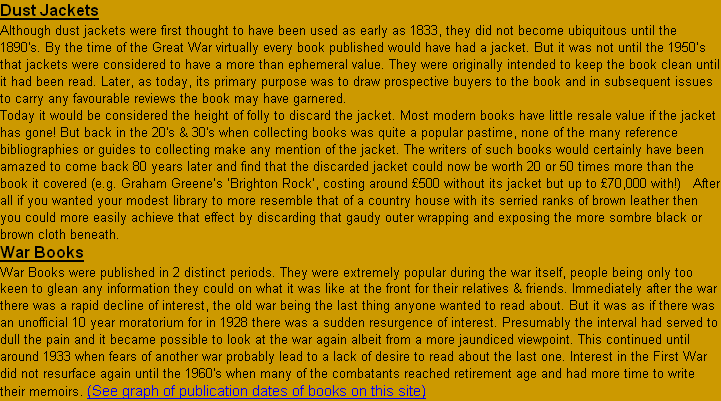 I DO NOT produce facsimile jackets but many are available from Mark Terry’s Facsimile Dust Jackets site listed below. I would welcome additional pictures of jackets I do not have for inclusion on this site. Please send them as Jpg’s - preferably no more than 50 KB in size – to my e-mail address below. I hope this will become an important resource for study in this neglected area. 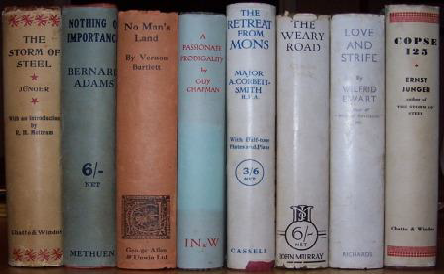 There seem to be very few sites on the net where dust jackets are displayed. I’ve listed a few in the links section alongside. Only a few books on the subject spring to mind : Jackets Required by Steven Heller & Seymour Chwast, Chronicle Books, San Francisco 1995, Front Cover by Alan Powers, Mitchell Beazley 2001, Eighty Years of Book Cover Design by Joseph Connolly, Faber 2009 & Book-Jackets : Their History, Forms, and Use by Thomas Tanselle, BSUVA 2011. There are several dealer catalogues from the past, which were essential to this passion of mine - those of Charlotte Robinson with their splendid covers taken from A Subaltern on the Somme & Schlump, Peter Scott’s catalogues for Bertram Rota, particularly 1988’s Catalogue 245 & William Reese Catalogue 150 of the Barry Maurer collection. Of the current dealers Turner Donovan is probably the best although his catalogue is now online only. 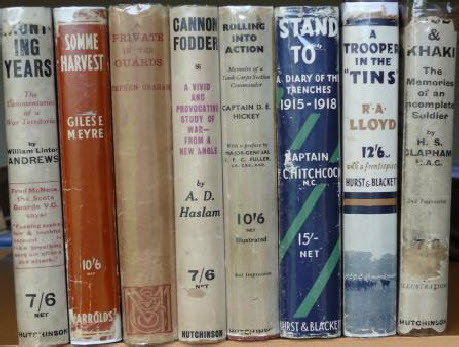 Between the Covers while not specialising in War books still houses a splendid display of jacketed books. My apologies to the few dealers whose pictures I’ve used without acknowledgement. Also my apologies at the rather inadequate nature of the indexing on the site. This is purely an amateur construction which will I hope improve with more familiarity with the software (a forlorn hope - after all this time I fear the format is fixed). Cyril Falls - War Books. 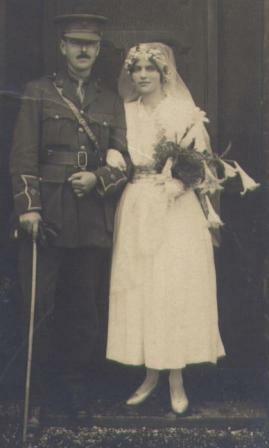 Peter Davies 1930. Highly opinionated but still invaluable. 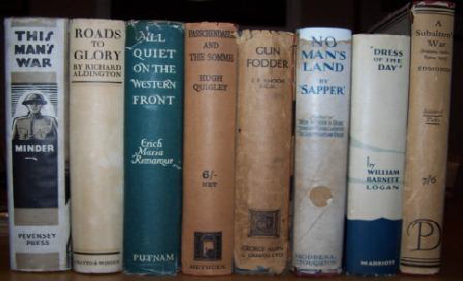 Hager & Taylor - The Novels of World War One. Garland 1981. Over 1200 works listed. F. Van Hartesveldt - The Battles of the Somme, 1916. Greenwood 1996 & The Battles of the BEF, 1914 - 1915. Praeger 2005. Both very extensive but with the emphasis on Unit Histories. 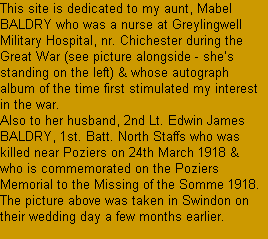 Friends have suggested I put a few details about me on the site - perhaps it all seemed too impersonal! I’ve spent all my working life in Cancer Research ( 138 papers - Google Scholar), but took early retirement 6 years ago to give me more time to spend in bookshops (or ironing if my wife has her way!). I started collecting about 35 years ago and now have over 6000 volumes, about 1/3rd of which are Great War. 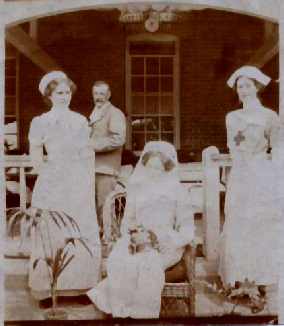 My interest is down to my aunty Mabel (see above) whose house was full of little souvenirs from her time as a nurse in the War, particularly an autograph book in which many of the soldiers she cared for wrote poems and drew pictures. I still have it along with various photographs, medals & a souvenir German bayonet which my uncle brought back for her from the front. I can’t say it was ever easy to find these books, but when you did they were usually cheap. Not so now, although thanks to the Internet American editions are relatively common. Unfortunately I didn’t bother with the jackets in the early days so I now spend most of my money upgrading existing copies! If I could only take 2 of them to the desert island they’d be the Bernard Adams ‘Nothing of Importance’, inscribed by his sister who was responsible for the books’ posthumous publication and Rosenberg’s Poems, inscribed by his sister, Annie Wynick, & once belonging to Rosenberg’s biographer, Joseph Cohen. I live near Brighton on the south coast of England. I hope you like the pictures. Around 10,000 jackets are on display from Mark’s holdings of over 35,000. Many books from this site can be seen there. A remarkable collection of images from books & magazines of the period. A lifetimes work! Much Ado Books High Street, Alfriston, East Sussex. A mixture of new & secondhand books in the friendliest atmosphere imaginable. Bookshops just don’t get much better than this! Winner: Independent Bookshop of the Year 2007. 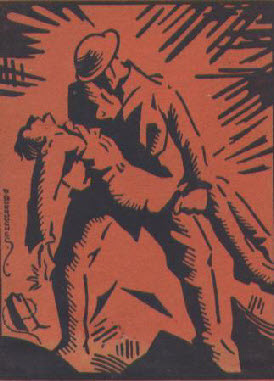 One of my regular contributors, Fons Oltheten, has begun publishing translations into Dutch of several major WW1 novels. These beautifully produced volumes can be seen & ordered from his website. Babylon Revisited Rare Books. 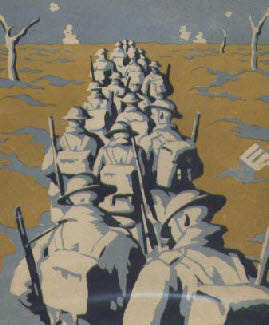 Their recently re-launched website carries a large stock of War literature with excellent high-quality images. Field Punishment No. 1 Canada’s War Literature. An interesting new blog by James Calhoun examining Canada’s major writers on the War, amongst whom are many you will find on this site such as Peregrine Acland, Redvers Dent & George Godwin.